LOVE IN OUR HEARTS FROM INDY! Summer Camp in Indy was the BEST!!!! We all left with peace in our fingers and love in our hearts! 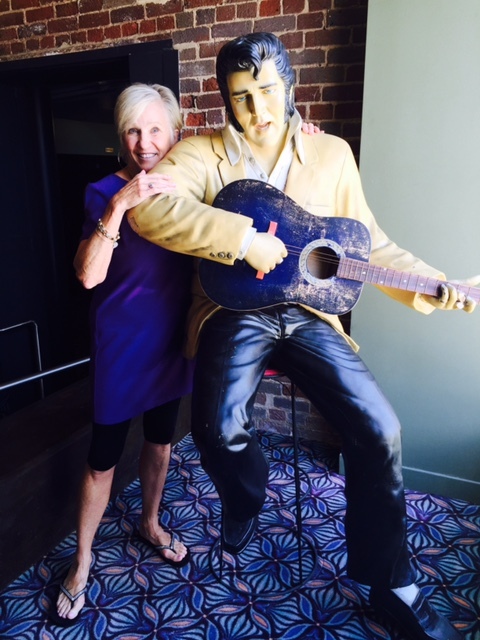 If you’ve never watched this video of Susan Salidor’s song it will put a smile on your face! It should be the theme song for your class this coming school year. I'll be doing Summer Camps in Detroit in July and Austin in August,. (Go to sde.com to get details.) 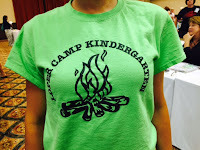 It's just like real camp with songs, crafts, games, and new friends. There won't be any bugs, but we'll learn how to turn standards and rigor into fun and games!!! No matter how they try to overwhelm us with academics and assessments, we will never let them take away our JOY! Look at these fantastic celebrations the teachers did to end the year on a happy note. *Parents write letters for “mail call” and the children write back. 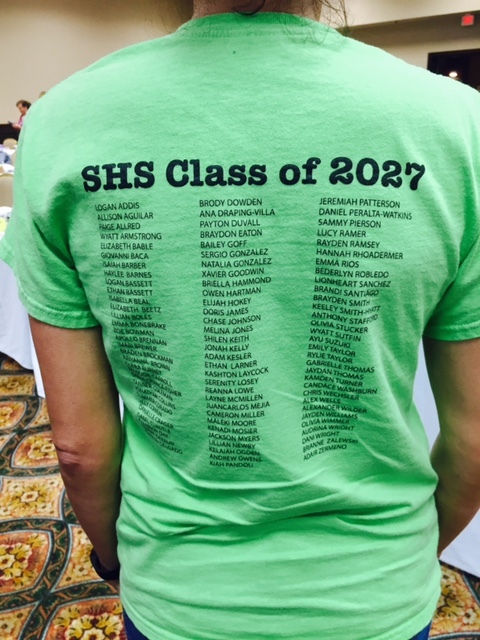 *Look at our camp t-shirts with the kids’ names on the back. *Take an ABC nature walk. *Make s’mores and trail mix. *Bring blankets, towels, sleeping bags – take off shoes to read, do work, listen to a story. *Go fishing for words (plastic pool and words with magnets). *Go on a bear hunt. Eat “frozen” Chex mix (vanilla). Make a snowstorm in a bottle (small water bottle with glitter). Do Epsom salt snow painting and snowflake snow paint. Do a sight word snowball fight. Find “S” balls and write the word. *Block off the end of the hallway area with table clothes, banners, and balloons. *Students rotate freely through the stations. 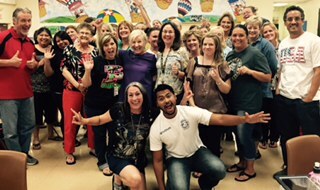 We decided to plan a day of fun for our students at William Tell Elementary in Tell City, IN. We all dressed up, decorated the hallway, and danced to music on the playground. We learned about manners and tied other standards in as well. Children and teachers dress up like their favorite nursery rhyme or fairy tale character. They have to bring the book or a paper with the nursery rhyme on it. 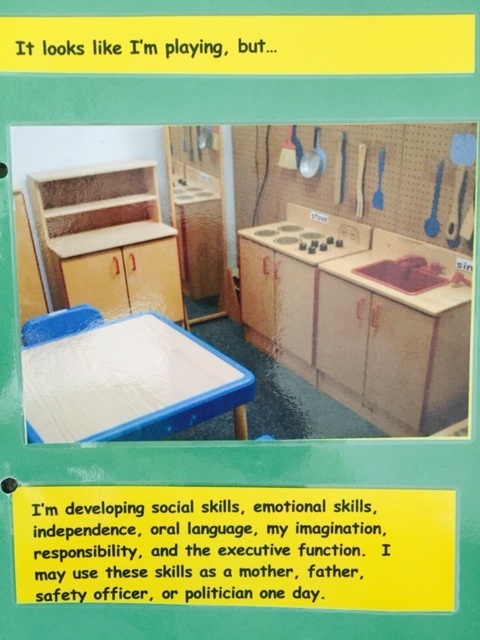 Each of the four kindergarten rooms has an activity to go along with the theme. After the students have visited the different classrooms and finished the activities we have a parade down the hallway for other grade levels. Here are a few more ideas from Indy Summer Camp. Set up a "peace corner" in your classroom where children can go to self-regulate and regain self control before returning to the group when they are overwhelmed or frustrated. Two little words I'm learning today. Two little words so easy to say. To show my gratitude I've found a way.. I can say, "Thank you! Thank you!" Good-bye, good-bye, we worked hard today. We'll see you tomorrow, tomorrow is ______. time for story come right here. Quiet hands are in your lap. Time to look and time to hear. Directions: Attach Velcro to the fly swatter and to the back of the cards. Place the cards face down on the floor. Kids "whack" the cards with the fly swatter and then identify the information. 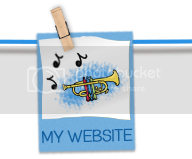 *Use it for categories (farm animals, things we eat, etc. ), beginning sounds, rhyming, sight words, letters, etc. It can be used in a small group, whole group, or independently. *We also have boards that they can stick them on after they swat them. 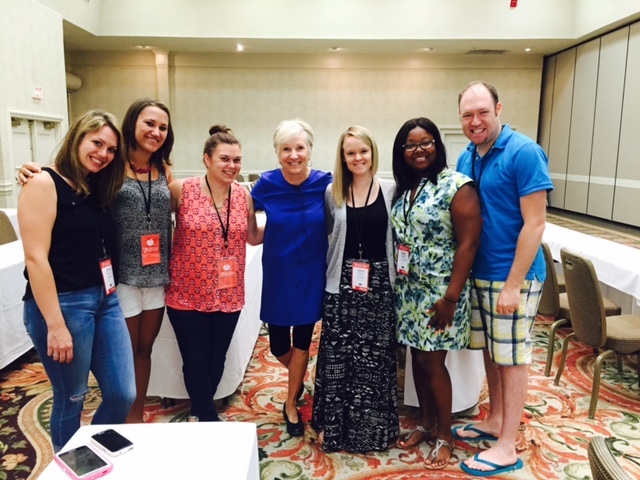 It was HOT outside in Orlando, but look at all my COOL new friends! HAVE A CUP OF MATH! It's time to give math some "love." Write numerals on plastic cups and ask children to put them in order. Hint! If you use bathroom cups you can store them in a Pringle's can. *Use cups for place value - one color for hundreds, one for tens, and another for ones. *Write fact families on cups for children to rearrange. Can they write the different equations? *Have children sort the cups by odd and even numbers. Write math problems on the tops of the cups. Write the answer on a sticky dot and put it inside the cup. 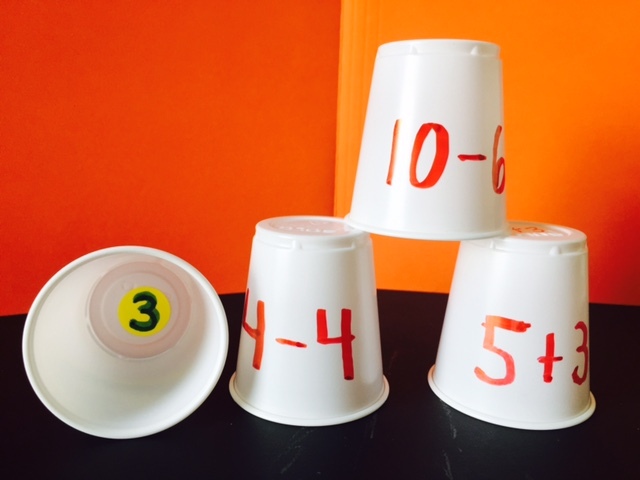 Children can self-check and then use the cups to build a pyramid. Place a certain number of pennies on the table in front of a cup. Explain that you will hide some pennies under the cup. Have children close their eyes as you hide a few pennies under the cup. Can they guess how many are under the cup? *This would be a fun game for children to play with a partner. Trace around the bottom of cups on a file folder. (Bathroom cups work best for this game.) Write numerals on the circles or letters on the circles. 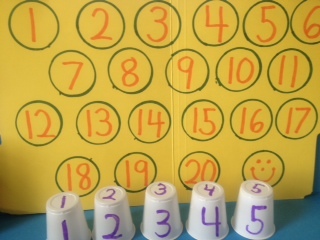 Challenge children to match cups and circles as fast as they can. Mix the cups up and then see if they can stack them in order. They are odd all the time. They are even -keep it straight! *Explain to look at the last digit and then recall the poem! consonants in blue and vowels in red.) 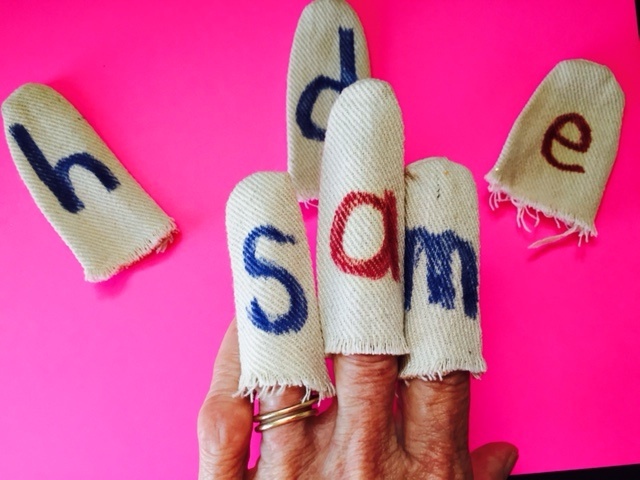 Children insert glove fingers on their own fingers to make CVC words. More! 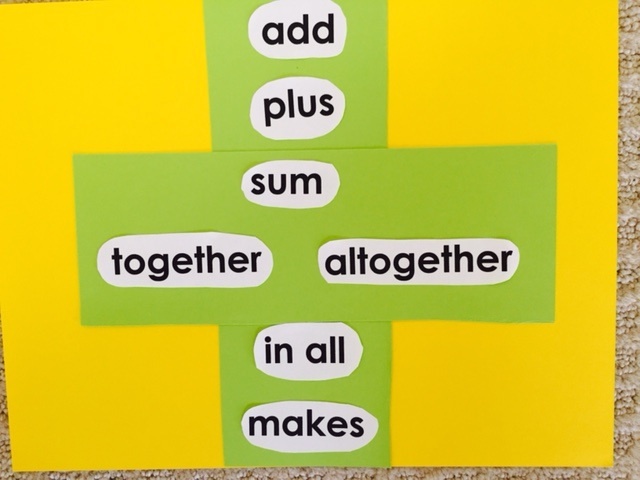 Give children a list of two letter words to make and read. Let children make word families with letter fingers. How? Write a letter on each plate. (You can do uppercase, lowercase, or both.) 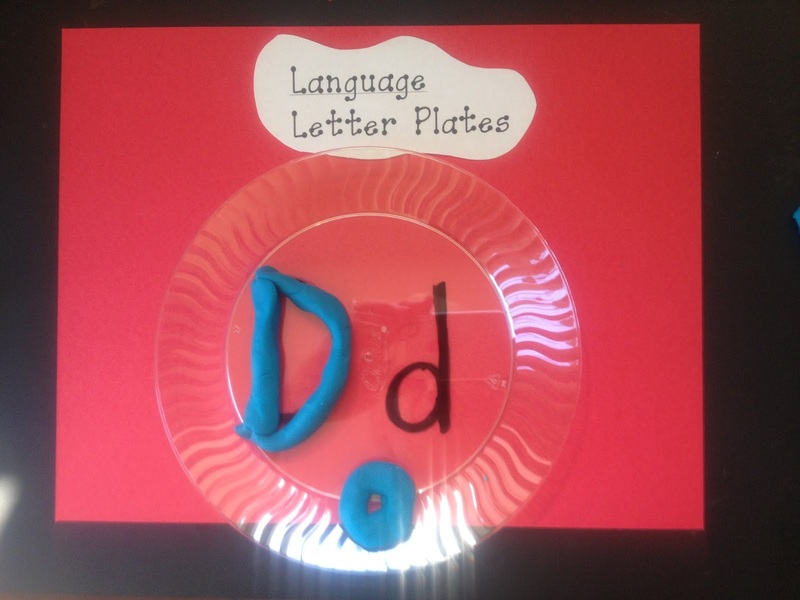 Children take the play dough, roll it, and place it on top of the letter. Can they make an object that begins with that sound? How? Write letters on the cups. 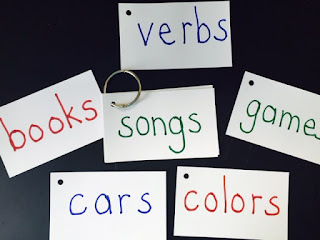 Children can use these to make sight words, match upper and lowercase letters, make CVC words, etc. More! Ask children to stack the cups in alphabetical order. Write words on cups and use for making and reading simple sentences. How? Place dot stickers on the cubes and write letters on them. Children can use the cubes to make sight words, word families, singular and plural, etc. Right now I'm tiptoeing through the tulips in Amsterdam. My husband and I are meeting Holly and her family there. (They have been at the University of Adelaide for several months.) The windmills will come in second to seeing Kalina and K.J. We can't wait to take the pancake boat trip where you cruise around the harbor and can eat as many pancakes as you want. We're also going to Brussels and top on the list are the chocolate museum and comic book museum. We've got our priorities straight!!! I've got blogs ready to post while I'm gone, but I'll share some photos when we get home. Wishing you happy summer days! How? Place a set of magnetic letters inside the cookie tin. On the inside cover make three lines with a permanent marker. Have the children take out the letters and place them around the lid in alphabetical order. 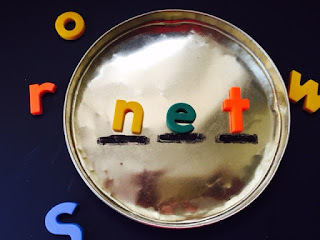 Call out a sound and have the children select that letter and place it on the first line in the lid. Call out a second sound. Call out a third sound. Blend the sounds and read the word. 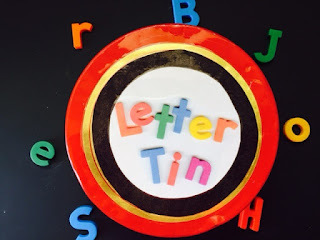 Use letter tins for spelling words and other word games. 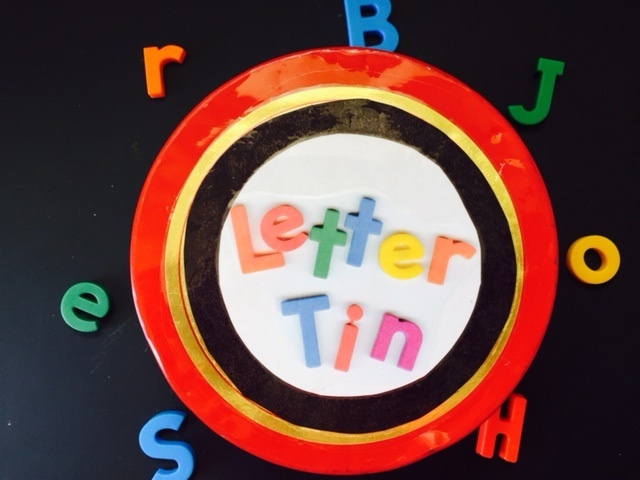 Letter tins are useful for partner activities or small group instruction. Store small magnetic letters in a breath mint tin. Use magnetic letters on a cookie sheet to make words. Hide magnetic letters in a sandbox and let children hunt for them with a magnet. How? Glue the magnetic letters to the jumbo craft sticks. Children can use these to match letters on classroom print. They can also find objects in the room beginning with that sound. More! Let children hold up letter pops as you sing alphabet songs. 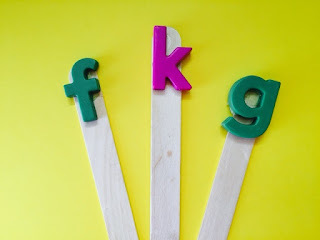 Children can get together with friends and make words with their letter pops. 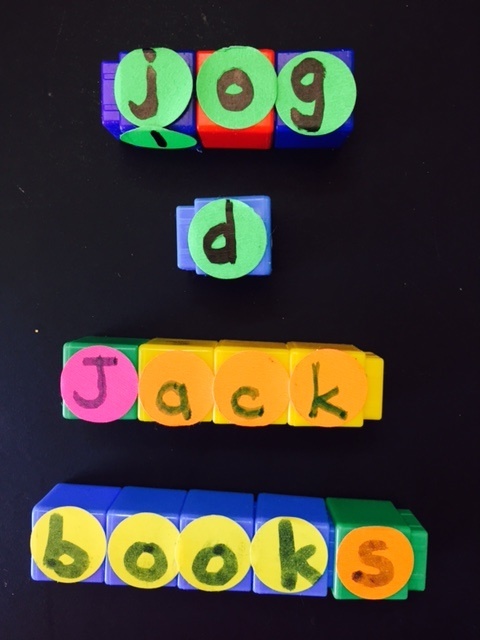 Make a set of uppercase letters and lowercase letters for the children to match. Place letter pops in a can in your classroom library. Children choose a letter and then try to find it in the book. How? 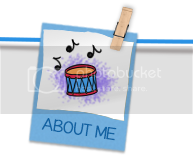 Decorate the trashcan to look like a man similar to the photo. Place magnetic letters out on the table. If children can identify a letter and make its sound then they can “feed” it (put it inside) Letter Man. More? Place the letters inside Letter Man. Children can take turns pulling out a letter, making the sound, and saying a word that starts with that sound. Ask children to feed Letter Man all the vowels…all the letters that are blue…the letters in alphabetical order…and so forth. 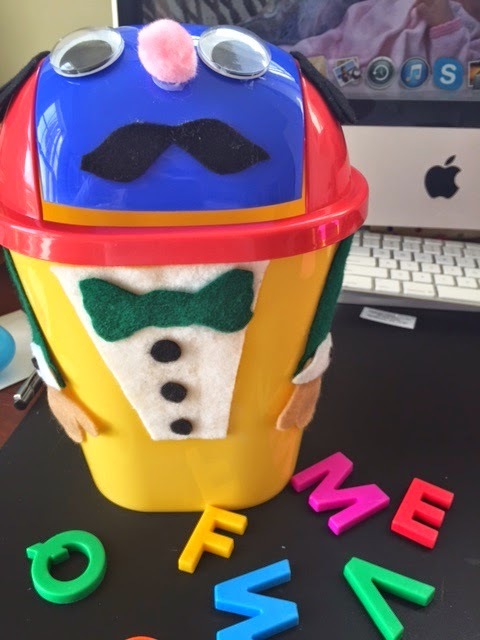 Have children spell sight words and then feed them to Letter Man. Have children draw a letter out of Letter Man and write it. Have children select a handful of letters and then try to make a word with them. 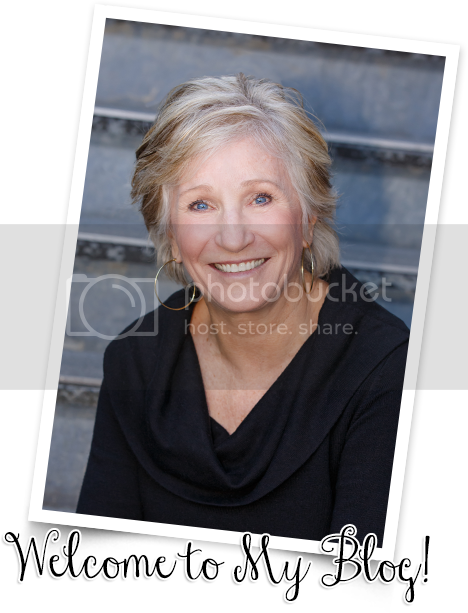 Sing this song to the tune of “I Know an Old Lady Who Swallowed a Fly” as you put letters in the trashcan. I know an old man who swallowed a (name letter). What would he say if he swallowed a (name letter). (sound), (sound), (sound) – (name letter). Over the next few days I'm going to share some materials you might want to make this summer for your classroom. And, yes, they are cheap, easy, and multi-functional. Most of these can be used with pre-k through primary grades. They could be used in a center, with a small group, or with a partner. For more of a challenge, have children write the words after they have made them. How? Write letters of the alphabet on the clothespins. Glue pictures of simple words on the index cards. Children choose a card and then sound out the letters and clip them to the index card to make the word. Hint! Write the words on the back of the index cards so children can self-correct. More? Write sight words on the craft sticks. 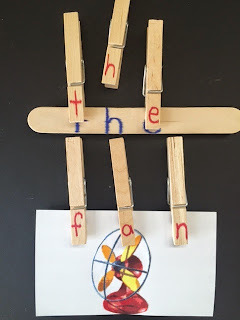 Children clip the clothespin to the stick to make the word. Can they write the word? Here is a picture of my reading calendar. Since I started this part way through the school year it will look a little different to start the year and transition as the students learn new skills and as the teacher realizes what skills the kiddos most need to work on. I have set aside about 20-30 minutes for this every morning, but it doesn't always take us that long. I show 4 pictures with 2 of the 4 starting with the same sound. On the first day we identify the sound at the beginning and decide which 2 start the same. On the second day we come up with other words that begin the same. On the third and fourth days the kiddos come up with words that begin like the other two pictures. On the fifth day I give them a word and they have to decide which picture it sounds like at the beginning. I have a list of five pictures and the beginning and middle sounds written next to them. Each day we do one picture. We decide what sound we hear at the end by catching it and then coming up with a few words that end like that as well. I give the class the word family and they come up with some. If they have trouble I will give them options between a few words to decide which one belongs. I give them a starting word and they help me spell it. I pick a sound to change and they tell me the new word. This is basically a word ladder without the ladder. I give them an onset and a rime and have them tell me my word. Then we take away the onset and they tell me what is left and then we do the same thing with the rime and then we put it all together again. Kiddos put their hand under their chin and count the number of times their chin hits their hand to count the syllables. We sort the pictures by the number of syllables they have. We sort the pictures by their medial vowel sound. I use baggies so that the kiddos can still see the pictures if they need help. I have all 100 of our sight words in the blue container and we go through about 10 or 15 everyday. I write a sentence incorrectly and the students have to tell me how to fix it. I start with a lower case letter, leave out spaces, spell things incorrectly, use the wrong form of the word and leave off end punctuation. 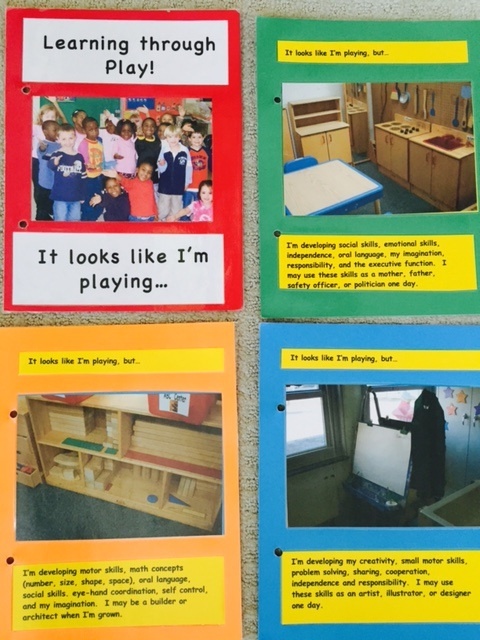 I show them 6 pictures and they help me organize them into rhyming sets. During the week we come up with other words that could also go in each group and I give them words to decide if they belong or don't belong. *I found all of the pictures online using Bing or Google. Everything can be done without pictures, but so many of my kids are visual learners and seeing the pictures helps them focus on the sound and not trying to remember what word I said. I think many of you know that I live in Charleston, South Carolina, and I thank you for your prayers. We are hurt, sad, outraged, shocked...and we are all grieving. My husband and I have worshipped at the AME church where the tragedy occurred and it is a church of LOVE. I have no words - only tears. I am so proud of the way our city has come together to hold hands and try to get through this. I am reminded of my song called "The African Village Song." It's a song about good times (when the sun comes down) and difficult times (when the rain comes down). But the rain and the sun make the flowers bloom. The flowers are all our children. And the children are why we keep going, and why we hold hands, and why we know that love will sustain us and bring us peace. From my heart, I thank you for the prayers for our city. It really doesn’t matter at all. (Rub fingertips back and forth. When the rain comes down on everyone. This is the Ravenel bridge where Charlestonians will come together tomorrow night at dusk to hold hands. I'll be in Indianapolis for my Summer Camp, but I'll still be holding hands. Use appropriate tools strategically is a practice recommended by the NCTM. 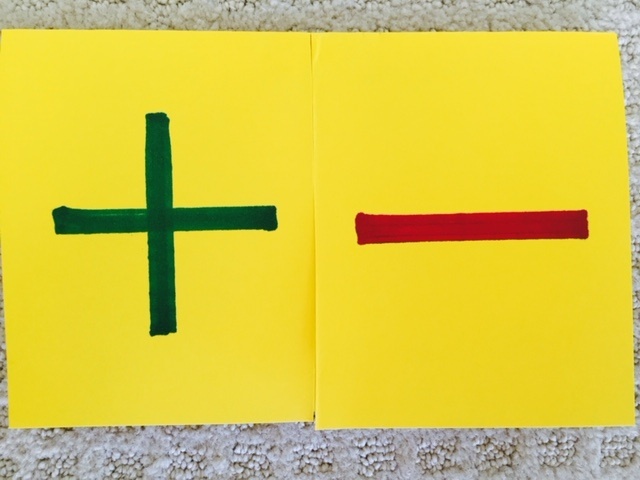 Math experts emphasize the importance of focusing on signs because mistakes are often made when children do not look at the signs. Remind children that you always have to look at the traffic light when you drive so you’ll know when to stop and when to go. In math, you always need to look at the signs before you begin so you’ll know what to do. Math is fun to do. So you’ll know what to do. They’ll give you a clue. 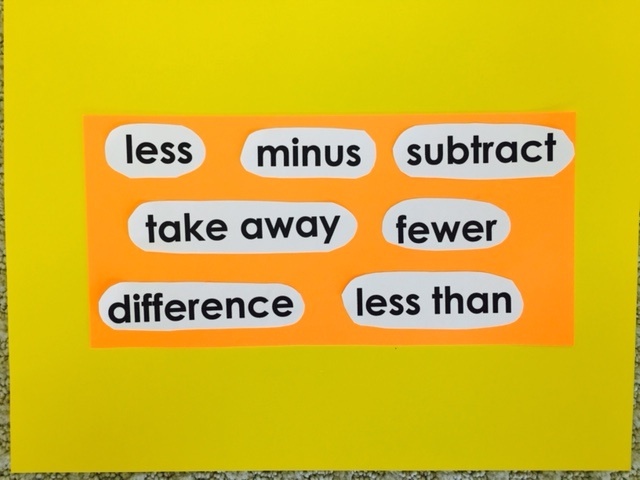 Make signs for your classroom with key words similar to the one shown. Math Toolkit - Fold a sheet of paper into fourths. Open and fold in half. Cut on the crease half way. Write “+” on one side and “-“ on the other side. 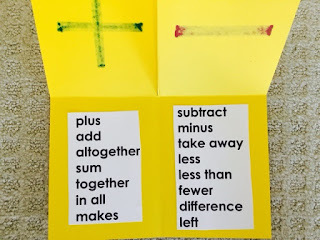 Write key words that remind children to add under the “+.” (add, plus, put together, makes, in all, sum, etc.) 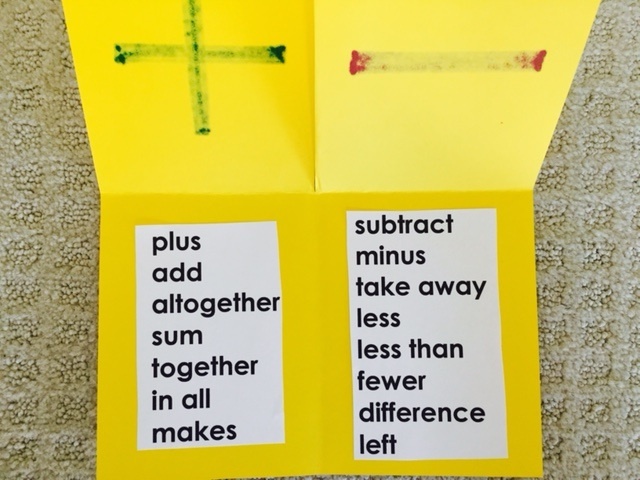 Write key words for subtraction under the “-.” (minus, subtract, take away, less than, fewer, difference, left). 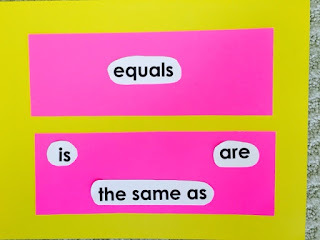 For the equal sign write equals, is, are, the same as, etc. 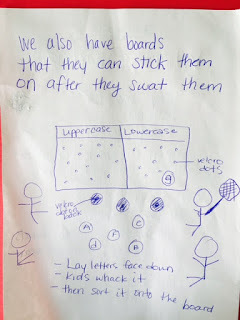 I have one more awesome idea for active learning for math. Children put their hands in the air and say a number. Touch their heads and say “plus” or “minus.” Touch their waist and say a second number. 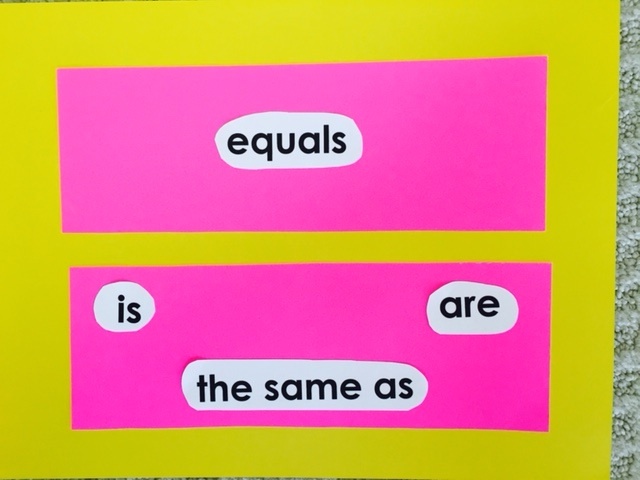 Touch knees and say “equals.” Touch feet and say the answer. *Whisper - Let the whole class participate by whispering as many words as they can. *Toss and Tell – Throw a beanbag around the group and each child must add a word to the category as they catch the beanbag. *Brainstorm - Write words on the board as the students call them out. *Think Time - Give older children 2 or 3 minutes to write all the words they can think of. You could also divide students into partners or small groups to do this. Hint! Adapt the categories to the specific age, skills, and interests of your students. 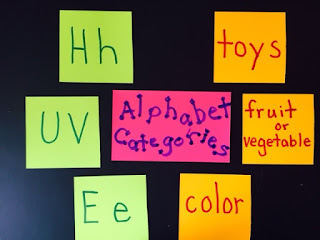 To make this variation of categories you will need 2 sheets of poster board of different colors. Cut the poster board into 4” squares. (You will need 23 squares of each color.) On one color print alphabet letters. (Print “u & v” on the same card and “x, y, z” on another card.) On the other color print one of the above categories. Actually, as you read over this you will realize you naturally do these things daily. When you read the morning message, big books, or leveled readers you are doing RAN. When you count on the calendar, read the world wall, play charades, or categories, you are improving RAN. RAN and RAS can be integrated into large group, small group, or partner activities. According to research by the National Early Literacy Panel, RAN and RAS are two variables that correlate with later literacy. Rapid Automatic Naming (RAN) is the ability to rapidly name a sequence of random objects, letters, shapes, numerals, or words. Rapid Automatic Switching (RAS) - Letters, colors, and shapes are located in different areas of the brain, so when you switch from colors or shapes to letters and back again it’s referred to as RAS. RAN and RAS are especially predictive of reading and writing fluency. However, doing these activities with young children can be meaningful because they connect the visual with the verbal and require children to focus and pay attention. This link will give you more information and some sample activities. Note! I think you could easily do these activities on a flannel board or with a pocket chart. This link will give you further insight on other simple activities you can do during transition times. How many cars can you name? How many words can you think of that rhyme with “bed”? 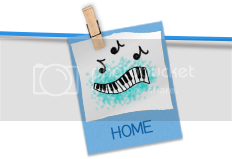 Word retrieval and rapid automatic naming can also be improved with high interest games such as charades, password, Pictionary, etc. I hope you learned something new and interesting today. I did!! I yam what I yam! All my life I’ve taught through songs, movement, games, hands-on activities, and play. Boys and girls, we need to all get on the ACTIVE LEARNING bandwagon while it is HOT! I’ve been working on my new seminar called “Dr. 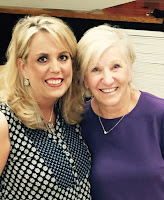 Jean’s Active Learning Adventure: Let’s make it purposeful, planful, and playful.” I came across this idea that I used in my classroom and it’s perfect for helping parents, administrators, and visitors understand the value of active learning. All of my centers had signs that described what children were learning as they played. Below you’ll find some of the captions that I used. I thought it might be something you’d like to create this summer for setting up your classroom. Dramatic Play – It looks like I’m playing, but I’m developing social skills, emotional skills, independence, oral language, my imagination, responsibility, and the executive function. I may use these skills as a mother, father, safety officer, or politician one day. Blocks - It looks like I’m playing, but I’m developing motor skills, math concepts (number, size, shape, space), oral language, social skills. eye-hand coordination, self control, and my imagination. I may be a builder or architect when I’m grown. Art – It looks like I’m playing, but I’m developing my creativity, small motor skills, problem solving, sharing, cooperation, independence and responsibility. I may use these skills as an artist, illustrator, or designer one day. 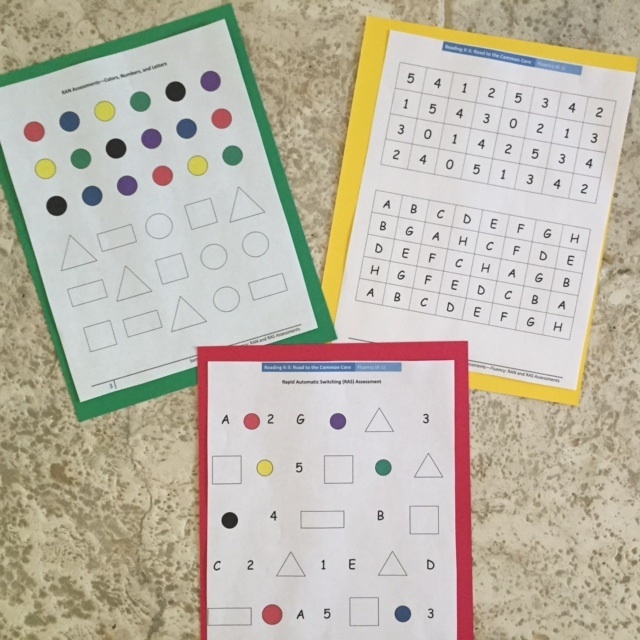 Math - It looks like I’m playing, but I’m developing oral language, social skills, small motor skills, concepts about quantity, shape, size, pattern, and an interest in math. I may use these tools as a computer programmer, accountant, or mathematician in the future. Library - It looks like I’m playing, but I’m developing alphabet knowledge, oral language, print knowledge, listening skills, eye-hand coordination, concepts about the world, and the desire to read. Maybe I’ll be a publisher, author, or librarian when I grow up. Science - It looks like I’m playing, but I’m developing a curiosity about the world, sensory skills, problem solving, language skills, and experience with the scientific process (observing, predicting, experimenting, recording, reporting). If I’m a doctor, lab technician, pharmacist, or landscaper I will utilize these skills. Small Motor - It looks like I’m playing, but I’m developing small muscles, eye-hand coordination, attention span, social skills, and concepts about size, shape, color pattern. I might use these skills as a chef or dentist one day. Language – It looks like I’m playing, but I’m developing oral language, alphabet knowledge, print connections, phonological awareness, visual skills, book knowledge, phonics, motivation to read. No matter what I become when I grow it, it will be important to know how to read. Writing - It looks like I’m playing, but I’m developing eye-hand coordination, small motor skills, alphabet knowledge, self confidence, vocabulary, and an interest in print. I might use these skills one day as a journalist, administrative assistant, or poet. Embrace the curiosity, enthusiasm, energy, and JOY of young children and let it be the momentum and springboard for developing skills and meeting standards! 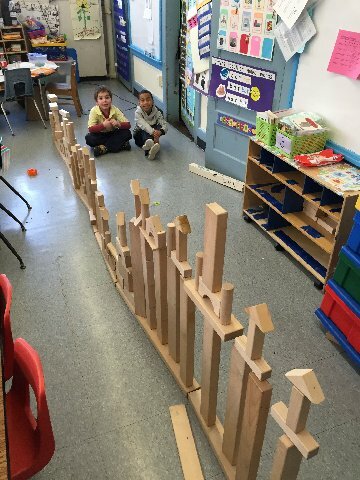 Play can be just as “rigorous” as a worksheet. LET’S MAKE IT PLAYFUL AND CHALLENGING! Hint! 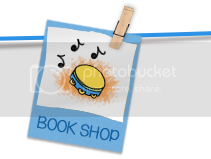 You could also make a book with the descriptions and photos of your students working in the centers. Let one child take the book home each evening to share with their families. 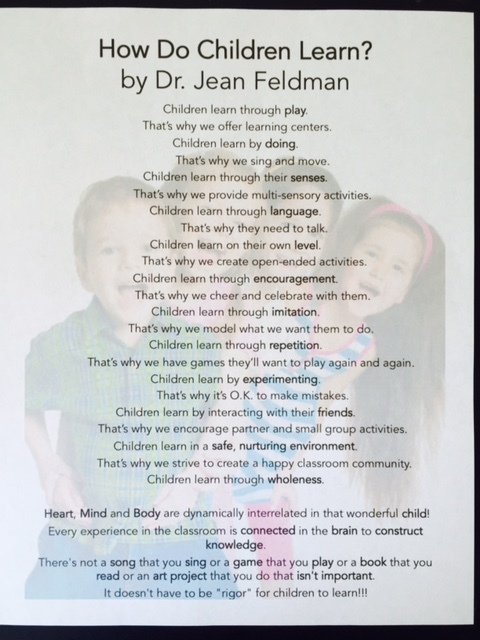 I received several emails yesterday about my post "How Do Children Learn?" It makes my heart happy when I know there are so many teachers who believe like I do. But it's not about us - it's about the children. We are on the front line with them every day and we know what works and how they learn best. And, yes, this goes for ALL children, not just kindergarteners. 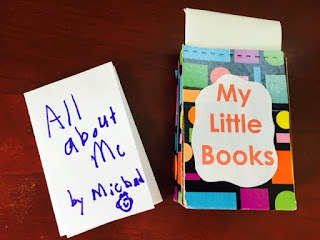 In many of my blogs I use the term "kindergarten" as a generic word for young learners, whether they are four, five, six, or seven...or eight or ten. Children are children! My friend Drew Giles made this poster to go with "How Do Children Learn?" What would I do without all my friends who are so much more technically advanced than I am!!! But, I do know lots of finger plays and songs!!! (Smile!!!) Thanks, Drew!!! That’s why we offer learning centers. That’s why we sing and move. Children learn through their senses. That’s why we provide multi-sensory activities. That’s why they need to talk. Children learn on their own level. That’s why we create open-ended activities. That’s why we cheer and celebrate with them. That’s why we model what we want them to do. That’s why we have games they’ll want to play again and again. That’s why it’s O.K. to make mistakes. Children learn by interacting with their friends. That’s why we encourage partner and small group activities. Children learn in a safe, nurturing environment. That’s why we strive to create a happy classroom community. Heart~mind~body are dynamically interrelated in that wonderful child! Every experience in the classroom is connected in the brain to construct knowledge. There's not a song that you sing or a game that you play or a book that you read or an art project that you do that isn't important. It doesn't have to be "rigor" for children to learn!!! If you haven't read this article in the New York Times about bringing "play" back to kindergarten you'll certainly want to read it today. THAT'S WHY I'VE BEEN TALKING ABOUT!!! Good news! I think the pendulum is finally starting to swing! You've got to read this article from the New York Times about the value of PLAY in kindergarten. Somebody in Anne Arundel County, MD, has the heart of the child in mind. Truly, children can learn through purposeful play. Yes, we can integrate academic skills with games, songs, art, and FUN!!! That's what I've been talking about for years!!! 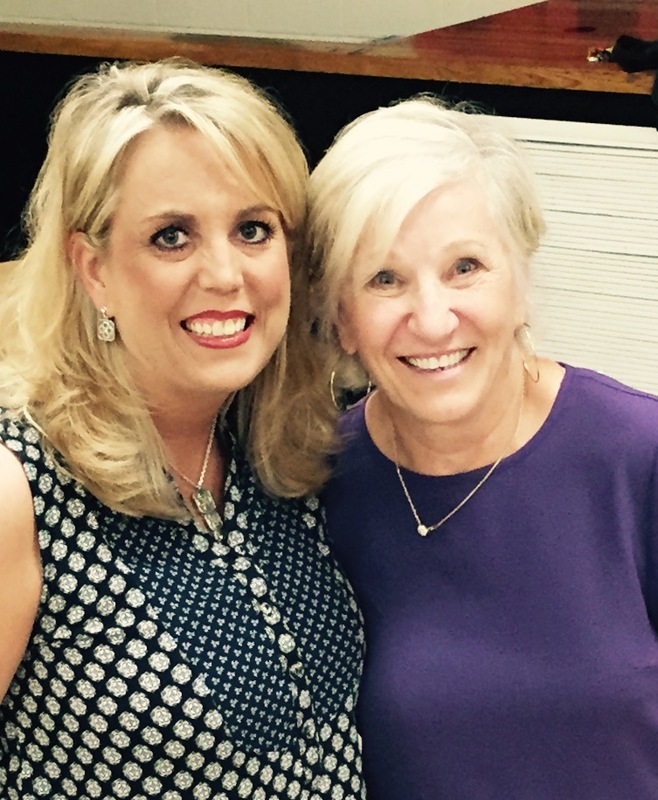 I was at two great school districts (Lewisville and Palmer ISD) this week in Texas who "get it"! 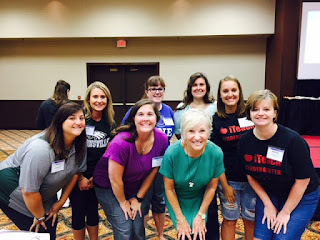 Teachers can have fun learning through play as well!! There was a statue of Elvis in the lobby of the theater where we had the workshop. A teacher said, "Let's get a picture of the 'queen' and king." Patty cake is a great brain break when children are restless. When you patty cake you cross the midline which activates both sides of the brain. It's good for eye-hand coordination. It's TPR - Total Physical Response - motor skills and oral language. Patty cake encourages self-regulation and the executive function. 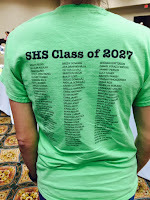 It nurtures 21st century skills - cooperation, collaboration, and communication. You've got purposeful practice for automaticity (aka repetition) because children will want to do it over and over. 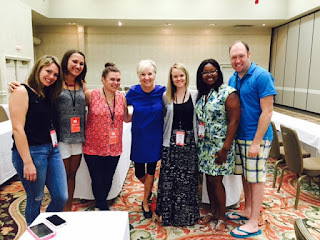 How about INTENTIONAL TEACHING? Choose words or skills you are working on and integrate them into this movement game. LET'S MAKE A PICNIC BOOK! Who can resist going on a picnic this time of year? Let children make a map showing the different places they passed on the way to the picnic. Fold a sheet of construction paper in half. Punch two holes by the top fold and insert a pipe cleaner to make a handle. Children can write stories about going on a picnic inside or they can draw foods they’d like to take on a picnic. Prepare a dramatic play kit for a picnic with a tablecloth (or towel), cups, plates, napkins, and plastic cutlery. What kinds of food would animals take on a picnic? Write their suggestions on the board. Let children circle the foods that they eat as well. 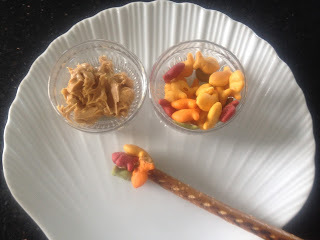 Plan an animal picnic with carrots, celery, apples, nuts, berries, etc. for snack. They can all be used to juggle! I just love random holidays like "World Juggler's Day" on June 20th. Why? They are like writing prompts and give me ideas to share with you. Juggling is fuel for the brain because it requires you to cross the midline, develops eye-hand coordination, and can improve focus and self-control. 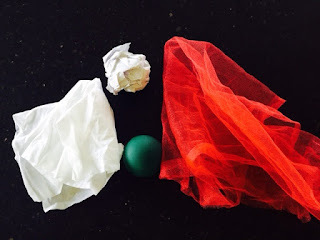 Juggling can be a great brain break in the classroom or an activity to entertain children on a summer day. It can be done inside, outside, or in a small area. Begin by having children wad up a piece of scrap paper. Can they toss it and catch it? Can they play catch with a friend? Can they toss it, clap, and then catch it? How many times can they toss it without dropping it? Practice tossing the paper ball from the right hand to the left. Add a second paper ball and let the fun begin! You’ve got to love Gold Fish crackers. They don’t have sugar, they are not messy, they are not expensive, and they are perfect for many math activities. 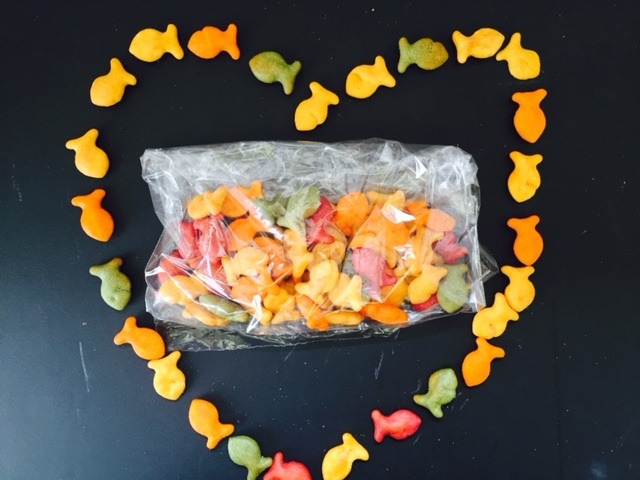 Estimation- How many fish are in your bag? Counting- Count and see how many you have. Did you estimate more or less? Is it an odd or even number? Sorting- How can you sort the fish? Graphing – How many of each color? Patterning- Can you make a pattern with the fish? 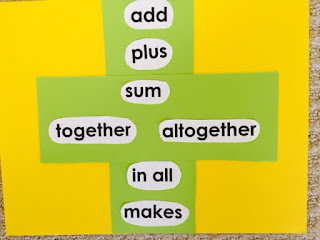 Addition and Subtraction – Make sets and join them together. Eat and subtract. 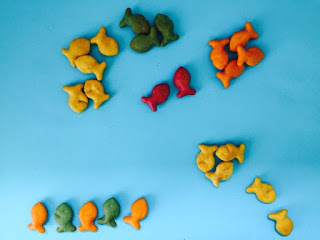 Can you make up a number story with the fish? You’ll need large pretzel rods, peanut butter (or cream cheese), and fish crackers for this snack. 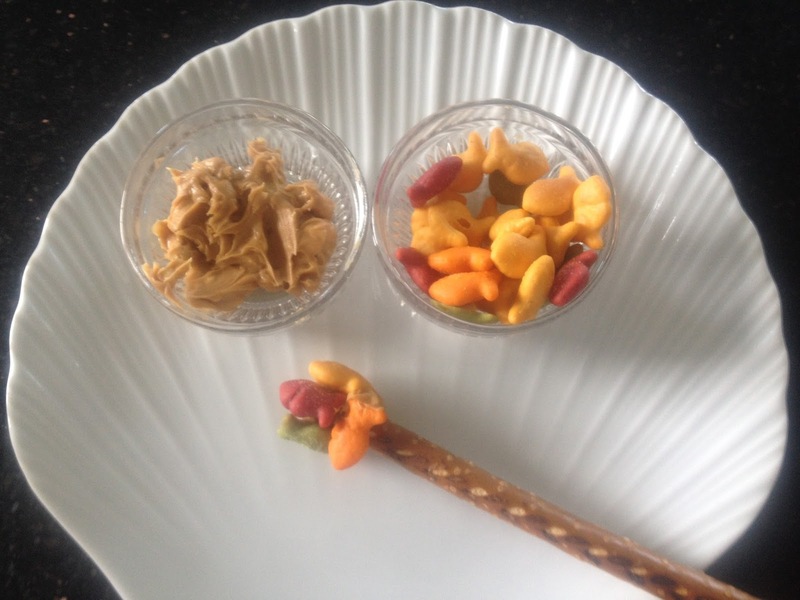 Dip the end of the pretzel rod (fishing pole) in the bait (peanut butter) and see how many fish you can catch and eat. There’s even a website (goldfish.com) where you can learn about Finn and his friends and play games. Believe it or not, there is actually a "Go Fishing Day." It is officially June 18, but kids will be happy to do these fishing activities any day this summer. Swimming up and down the bay? *Sing fast, faster, and super duper fast! Staple an 18” piece of string to the end of straw. 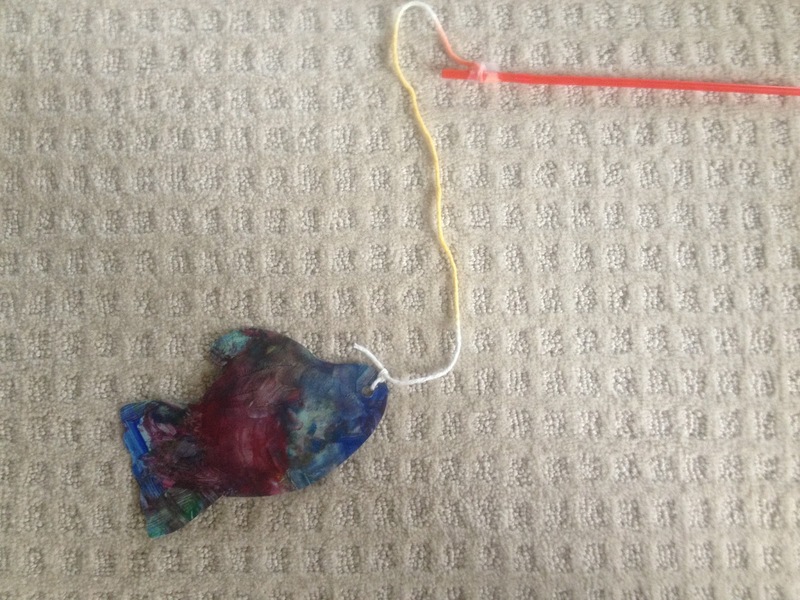 Let children make fish out of construction paper and tie to the other end of the string. 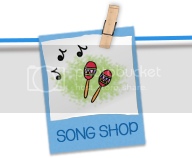 They can use these as they sing the song. 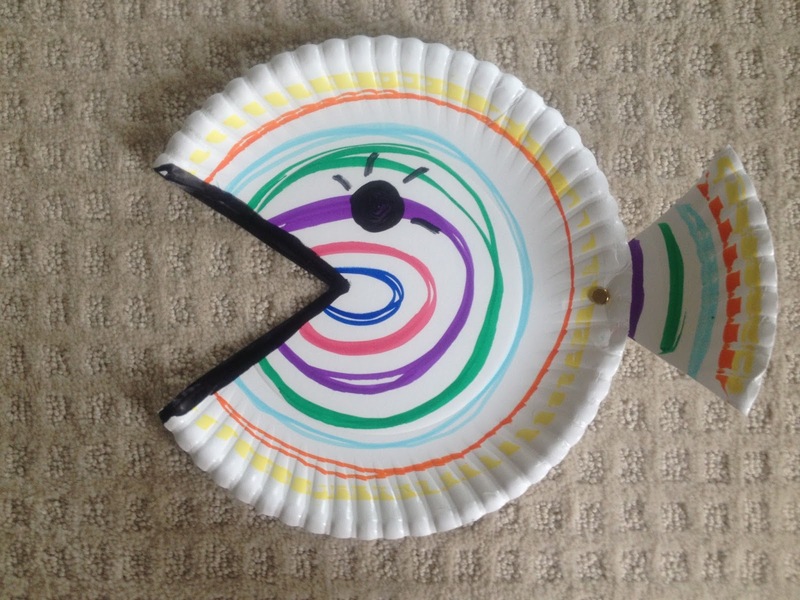 You will need paper plates, brad fasteners, markers, and crayons for this project. Cut a triangle out of the paper plate to be the mouth of the fish. Attach the triangle to the back with the brad fastener to make the tail. Color with crayons or paint with water colors. Hint! 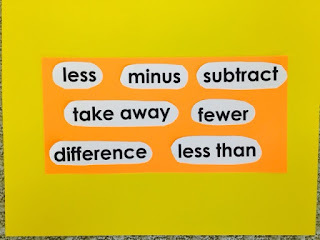 Tie in "greater than" and "less than" with the fish's mouth. *Make fish puppets from old socks. Glue on googly eyes, fins, and a mouth as shown.